Joker and Batman. Coke and Pepsi. Samsung and Apple. These two companies can’t seem to stop duking it out for the hearts, minds and money of consumers. And no surprise, both Samsung and Apple are looking to dominate your wrist this coming holiday season. Samsung has its newly announced Galaxy Watch, a rebranding of its smartwatch to bring it more in line with its other mobile devices. Apple, of course, has the Apple Watch. While the Apple Watch Series 4 is literally weeks away, the best-selling Series 3 is still around to compete for your wrist’s attention. But which smartwatch is for you? Is it worth following the crowd with the Apple Watch, or does the newly minted Galaxy Watch open up a world of new possibilities? Let’s find out. 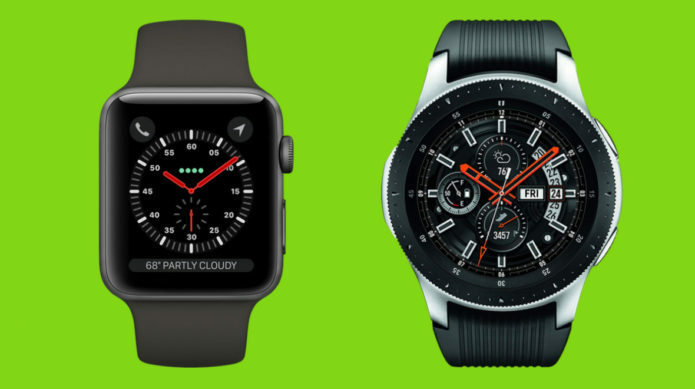 Apple and Samsung have very different approaches when it comes to smartwatches. Apple’s got a square-ish design heavily borrowing from the original iPhone. Samsung, on the other hand, wants its watch to look more like a traditional timepiece. The Apple Watch comes in a variety of case materials, from aluminum to ceramic, and in two sizes: 38mm and 42mm. There’s also a number of colors, including space gray, gold and silver. Plus, there’s the Nike+ and Hermes editions of the Watch, adding either a sporty or high fashion flair. Basically, you’re going to be able to buy an Apple Watch that suits your taste – as long as your taste fits into Jony Ive’s vision of a watch. 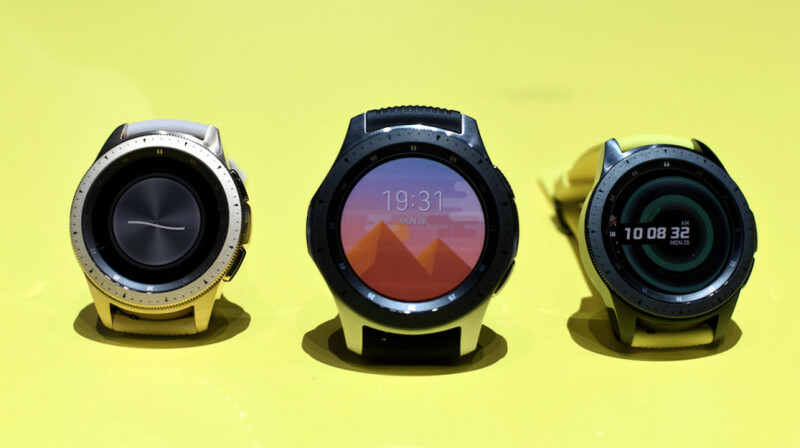 Samsung has some options with the Galaxy Watch, but there aren’t as many. There are two sizes: 42mm and 46mm, making the Galaxy Watch a more obvious choice if you want a larger smartwatch. On the flip side, if you’ve got smaller wrists the Apple Watch’s smaller size may make more sense here. The Galaxy Watch is also much heavier, coming in at 49g for the 42mm and 63g for the 46mm. The 38mm Apple Watch is 26.7g while the 42mm Apple Watch is 34.9g, bumping up to 52.8g if you opt for the stainless steel. The Galaxy Watch also comes in three colors, but options are a bit more limiting. In the 42mm, you can choose between rose gold and black, but if you want 46mm you’ve only got the silver option. With the Apple Watch, each size is available in each color – at least at the aluminum level. Let’s not forget the army of bands Apple has also made to complement the Apple Watch. You could go mad collecting new bands each season, as Apple refreshes them to keep up with the latest trends. Samsung also has some band options, but it also has regular 20mm and 22mm interchangeable straps – so you can pretty much use any strap you’d like. Apple and Samsung have similar – yet different – ideas about how to control your smartwatch. Apple has leaned on its Digital Crown, which you spin around to scroll through menus. It’s simple and works well, but there’s something extremely satisfying about using Samsung’s rotating bezel to navigate the display. Samsung has also done a good job building Tizen to take full advantage of the rotating bezel, making it feel deeply baked into the experience and not just a nice extra. As for the screens, both of these devices have bright AMOLED displays, and in our tests both have performed admirably in bright sunlight. They’re both waterproof for swimming, both have NFC for payments and GPS for navigation. The Galaxy Watch does come with 4GB storage for music while the Apple Watch starts at 8GB of storage, jumping to 16GB if you opt for the cellular model. The Apple Watch may be the more universal design, appealing to the most people possible and working at some level for nearly everyone, but Samsung has the appeal of actually looking like a watch, even if it will be a bit too big for many. The Apple Watch and Galaxy Watch are both well built to be used standalone, should you opt to purchase the cellular versions. As previously mentioned, you’ve got storage for music, NFC for payments and GPS for navigation. Add in cellular for phone calls and messaging and you’ll be able to leave your phone at home while you head out for a run or a session at the gym. As for music, that’s where these two devices diverge. Apple naturally has Apple Music as the premiere streaming choice here. You’ll be able to stream music to your heart’s (read: data cap’s) content. Meanwhile, on the Galaxy Watch you’ve got Spotify as your number one option. Seeing as how Apple Music and Spotify are two of the biggest and most popular streaming services out there, you’re not truly losing either way. If you are a big Spotify fan, you will have to switch over to Apple Music for the Apple Watch and vice versa if you’re an Apple Music subscriber going for the Galaxy Watch. More importantly, if you’re an Android phone user, the Galaxy Watch is your only choice. While the Apple Watch only works with iPhones, the Galaxy Watch pairs with pretty much any device. However, in our testing we’ve found that the Samsung Health app for iOS does hang up more than it does on Android and that notifications were slow to sync, which isn’t the case on Android. If you’ve got a Samsung phone, the Galaxy Watch will play even better. Little things, like clicking a setting on your Galaxy Watch and having that menu open on your phone automatically, make for a better experience. Apple Pay and Samsung Pay are both here and both work well. Samsung nixed MST, which let you use contactless payments at any credit card reader on the Gear S3, in favor of space. That means that both payment systems work roughly the same. In terms of apps, Apple’s ecosystem is far more mature. Samsung has Spotify, but Apple has a much larget army of apps. It also plays nice with iPhone, which might be a huge differentiator if you prefer to live in Apple’s walled garden. In terms of watch faces, both companies are looking to separate themselves from the pack. Samsung’s new My Day face is quite interesting, letting you instantly see what events you’ve got coming up with a quick glance. Apple, on the other hand, has its ever-popular Modular watch face and the useful Siri watch face to keep you in the loop. Samsung’s watch will also greet you in the morning with an overview of the day once you pull it off the charger. This doesn’t necessarily work as well if you’ve been wearing the Galaxy Watch to sleep (more on that later), but it’s cute. Apple’s Watch has had all the bases covered, but with the Galaxy Watch Samsung has closed in enough. Things are enough of a wash here that your choice of smartphone will likely make the choice for you. The Apple Watch’s great strength in health and fitness is the catalog of apps it has at its disposal. From Nike to Strava, if there’s an app to measure or track your fitness, there’s a good chance it’s in the App Store and ready for your wrist. Samsung does have the Under Armour suite and Strava as well, but the breadth of options on watchOS dwarfs Samsung. While Apple has given some more love to its Workout app with watchOS 5, adding things like linking workouts and automatic detection, it’s still not as good as competitors like Samsung. Samsung’s got some good workout detection, which can tell if you’re walking along and automatically record it. You can also link up workouts should you be moving between them. Samsung has also upped the workout modes for the Galaxy Watch, moving up to 39 from 12. A lot of these new workout modes are geared towards weight training, something the Apple Watch still doesn’t fully support. There’s also rep counting on the Galaxy Watch. While Apple can use its heart rate monitor to let you know if something abnormal is going on with your heart rate, Samsung is working on stress tracking. It can use its heart rate monitor to check how you’re feeling and put you on a scale. If you’re stressed out, it can recommend a breathing exercise to calm down. Meanwhile, the Apple Watch will just recommend times to breathe; it doesn’t explicitly tell you whether you’re stressed out or not. While Apple will remind you to move around every hour, Samsung will recommend a workout to do every hour – you can accept or deny. It’s a nice little extra push that gives you some variation other than walking around in circles for a couple minutes. Finally, the big advantage the Galaxy Watch has over the Apple Watch is that it can do sleep tracking. While it doesn’t break down light, deep and REM sleep, it does tell you whether you’re restless or not. That’s better than the Apple Watch, which doesn’t officially support sleep tracking. 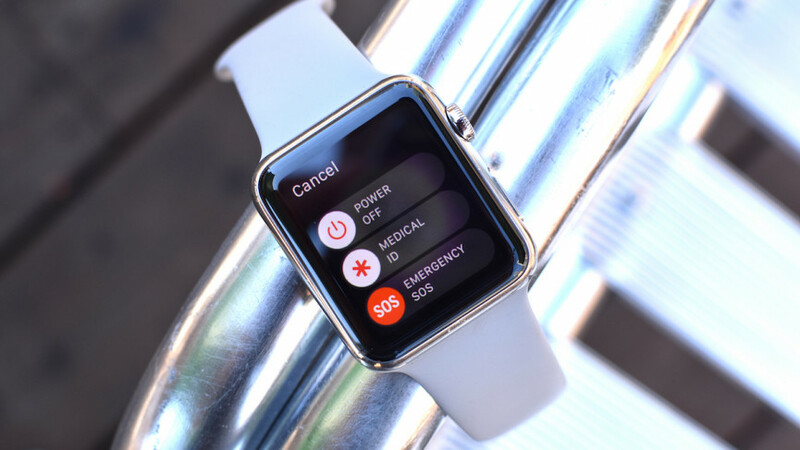 Apple has taken a slow and steady approach to building the Watch’s health and fitness powers. It’s done a good job, and a legion of third-party apps make it a strong fitness choice. However, the Galaxy Watch’s range of features, from stress tracking to sleep tracking, make it more appealing. This is one area where there’s no contest. The Apple Watch will get you through a day no problem, and if you’re lucky and conservative with use you may be able to make it through a half a day more. 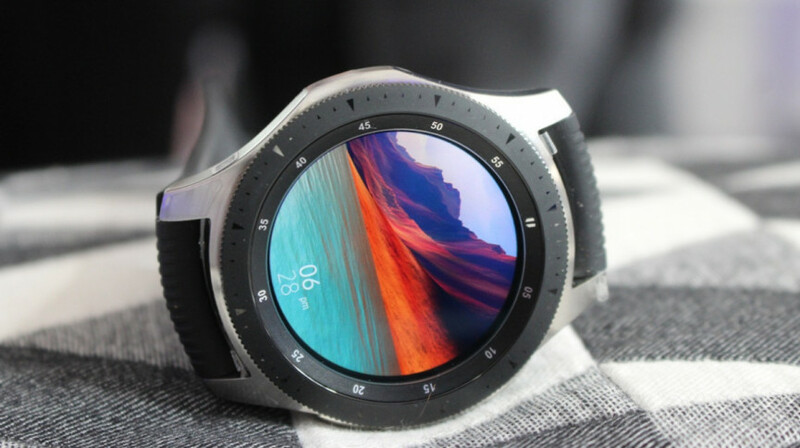 However, the 46mm Galaxy Watch can get you through a week with light usage – which likely means curbing notifications and not working out much. With normal usage, you should see at least three days – that’s what we’ve seen in our early tests. The 42mm Galaxy Watch will get you through four days with light usage, and a couple days with normal usage. That’s a fairly significant difference based on size, and it gives the 46mm Galaxy Watch the edge if battery life is the most important thing you look for in a wearable. This battery life means that Samsung can embark on sleep tracking, something the Apple Watch can’t do because you still need to charge it nightly. The Apple Watch starts at £329 for the 38mm non-LTE version and £359 for the non-LTE 42mm version. The Galaxy Watch is the same price in the US, but more affordable in the UK, coming in at $329 for the 42mm in the US and £279 in the UK. The 46mm version is $349 in the US and £299 in the UK. If you pre-order the Galaxy Watch, you’ll also get a free band in the box. Additional bands start at £25. Apple Watch bands, on the other hand, start at £49. There’s no word on pricing for the Galaxy Watch LTE versions yet, while with the Apple Watch we know they’re a £50 premium. Overall, you’re winning on price when it comes to the Galaxy Watch if you’re in the UK. If you’re in the US, you’re getting a better deal on straps, which makes sense considering it supports standard 20mm and 22mm watch straps. There’s a lot to like about the Galaxy Watch. 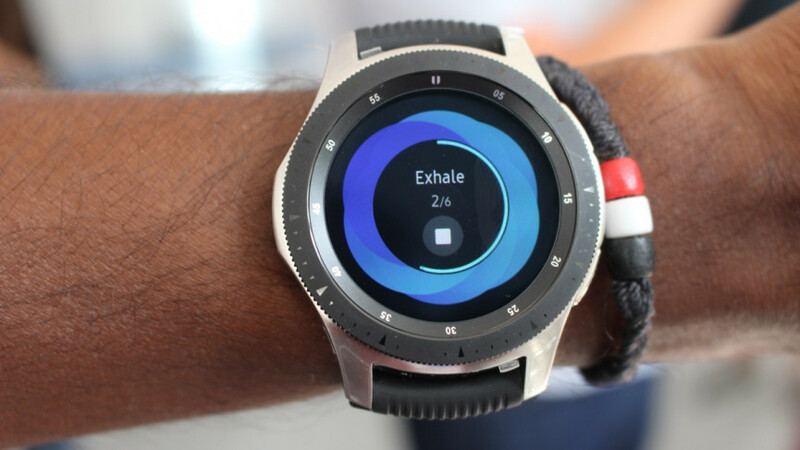 It’s got automatic workout tracking, good battery life (enough for sleep tracking) and Samsung made strides to make it better as an assistant. Apple still has a complete smartwatch experience, and there’s something to be said for its polish. If you’re already in the Apple ecosystem, and you’ve got an iPhone and are looking for a smartwatch, there really is no better option than Apple’s own. Similarly, that decision is already made for you if you’ve got a Samsung or Android phone. The Apple Watch is not for you, but the Galaxy Watch is no slouch.